The digital resources offered here comprise a major portion of the excavation archive from 1896 to present. They are made available free-of-charge for teaching and research purposes. Password protected material includes the excavations at the Sanctuary of Demeter and Kore and the Gymnasium, and excavation during the tenure of Charles K. Williams (1963-1997). Unpublished material from Corinth that is outside of these projects has been opened to the public. Large portions of the collections were digitized in 2007, co-funded by the Office of Regional Development of the European Union and the Greek State through the Operational Program "Information Society" of the 3rd Community Support Framework. Additional funding was provided by the Andrew W. Mellon Foundation. In 2009 the Samuel H. Kress Foundation generously gave to catalog our Numismatic Study Collection. Much of our archive remains in analog formats. Digitization and cataloging are ongoing. Types represent the wide variety of information that we capture in our archive. They are practical units based on media, spatial data, and other functional criteria, such as how and where part of the archive is stored. The links below take you to a short description of each type. The same links on the sidebar to the left will filter your search results to the type that you click. The ASCSA excavations in Ancient Corinth are formally published through the Corinth monograph series (red books) and in articles in Hesperia, the journal of the American School. Many articles also appear in the American Journal of Archaeology, the Journal of Roman Archaeology, and elsewhere. 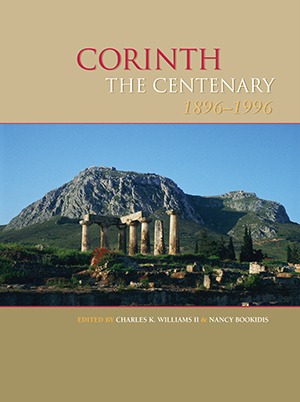 This collection covers a wide range of Corinth related topics but is not exhaustive. Efforts have been made to provide hyperlinks to services like JSTOR and Google Books, as well as to the publisher, though link collection is ongoing. Many bibliographic records link to artifacts, coins, and places and monuments (but not photographs). The user should not confuse these links with catalog entries made by the author. The links do not precisely mirror the catalog, because published catalog entries often aggregate non-joining pieces while our artifact database retains these as separate entities. This link highlights some recent publications on the subject of Corinth. Corinth Excavations serves as a training ground for the students of the American School of Classical Studies offering the opportunity for experienced and first-time excavators to supervise and document the work of trained workmen using a single context, open area excavation system. Area supervisors periodically write summaries of their work. Likewise the excavation director may produce a report of the seasons accomplishments. Synthetic narratives of the excavation process are helpful to understanding the more detailed records of Contexts, Images, and Objects. The reports of each seasons excavations will remain password protected until our formal report to the Greek Ministry of Culture in the autumn of each year. Early excavation in Corinth began with the aim to uncover the places mentioned by the Roman traveler, Pausanias. With the discovery of the fountain of Peirene excavators had a fixed toponym in the city and expanded their investigations. Much of the archaeological record is organized by places or monument names around which excavation occurred. Though the internal system moniker for this type is "monument" many of our excavations are more properly places. As archaeologists broadly explored the city, early excavation journals commonly covered many places. Later, as excavations became more targeted, focused, and standardized, the notebooks were restricted to a particular area. The West Shops and the Temple of Apollo. The places and monuments database provides loose geospatial control for the archaeological record. Before standardized excavation within an alphanumeric grid was implemented, a reference to a monument may be the best information available for the provenance of an artifact. Today, electronic total stations and GPS provide spatial control in excavation linking locations (X, Y, and Z) to global map projections. The Map view in the sidebar at left is helpful plotting data entities on a map. Architectural plans and object drawings document the discoveries of the excavation, namely architecture and artifacts. Drawings receive a three digit serial based on monument or excavation area, and number within that series. (e.g. 003 075, the serial number 003 designates the Central Area and Theater District and 075 is the 75th drawing in the series). State plan of the excavations in 1898 by A. S. Cooley. Pen and ink on linen. Since 1896, a wide range of photographic media has recorded the excavations-- glass plates, cellulose nitrate based (this collection was transferred to acetate based), acetate-based black and white negatives (in small, medium, and large formats), color slides, large format color positive, and digital. Some of the first photographs were developed in the tunnels of the fountain of Peirene. Statue of Roma found in the Panayia Field in 1997. Photographic images in the Corinth system receive accession numbers. All digital images presented here, whether scanned negatives or born-digital, are given a name identifier consisting of many parts: a media type (e.g. "bw" for black and white, "color" for color positives and slide, or digital), the year it was created, perhaps a roll number if strip film, and a frame number (e.g. bw 1999 011 036a, frame 36a on the 11th roll of black and white film taken in 1999, or digital 2007 0145 for the 145th digital photo of 2007). Note on image orientation: All film was scanned with the top of the negative oriented up. Thus, if the photographer found it necessary to frame the subject upside down, it will appear that way in the image. While some expert find this confusing and disturbing, the user may temporarily reorient the photograph for correct viewing by clicking the blue button that appears when the pointer/cursor hovers over the upper left hand corner of the image. Artifacts of material culture found during excavation are saved, cataloged and stored in the museum. Each object's provenance and physical characteristics are thoroughly documented and described, and museum staff supervises data entry into appropriate fields of the database. Still, many of our artifact data records exist only on inventory cards or in older find inventory books. KA, KH, KL, KM, KN, KP, KT, and KV for architecture, figurine moulds, lamps, metal, pinakes, pottery, figurines, and votive pottery from the Potters' Quarter. T for Shear Excavations; TF for Asklepieion Terracotta Figurines; VT for Asklepieion Votive Terracottas; Z for Zygouries artifacts. Coins are a rich and significant artifact type in the archaeological record, especially for chronological control. Note on 'skeleton' records: Users of ASCSA.net will in some case find incomplete or 'skeleton' records used as place holders for artifacts and coins, awaiting rich data to complete them. This practice allows linked relationships to be preserved, so that for instance, the user can navigate from a basket record to objects in that basket (which may not have detailed descriptions) to photos of the objects. It also allows the user to note that, while rich data may be absent for the time being, an artifact indeed exists in the collection. A Basket is the smallest unit of stratigraphic excavation that was recorded in the field notebooks (one floor layer, one layer in a well, one wall, etc.). All pottery and objects found within a basket are initially kept separate for analysis. Excavators have employed several naming conventions-- sometimes beginning each work day with basket #1 and sometimes with a single series starting with basket #1 for each notebook. A basket name or identification references the notebook (NB), basket (B), and perhaps a page in the notebook (P). Thus NB919 B12 P37 (see notebook scan below) is the 12th basket in notebook 919 and is found on page 37. As of 2007 with introduction of single-context, open-area methods, all contexts are numbered in a single sequence by excavation area. Lots are made up of one or more baskets and represent a single archaeological event or human activity. Since the 1960s with few exceptions, all material from each basket within a lot is stored separately and can be re-analyzed later if necessary. Lots are designated by the year and a serial number (e.g. Lot 2007 001). Deposits are contexts (one or more lots) that refer to any closed physical unit (well, cistern, grave, pit, etc.) in which the recovered finds present sufficient homogeneity to be of value in the study of type, style, and/or chronology. The general word Context is used in ASCSA.net to designate any of these named archaeological contexts, be it a basket, a lot, a deposit, a room, a building, or even an entire excavation trench. Archaeological excavation in Corinth was recorded in field notebooks. Early notebooks, especially pre-war, were often free form day journals. Later they became increasingly systematic and standardized. The notebook below contains a textual description of the excavation process, dividing an area into Contexts (independent archaeological contexts such as strata, walls, rooms, etc.). Notebooks also contain photographs, plans and drawings, and references to artifacts found during excavation. As of 2007 loose leaf context sheets have been used in the field in lieu of notebooks. The notebooks were scanned open and cataloged by page spreads (two adjacent pages). Each spread notes the page number only when designated by the author. In addition to find notebooks, a card catalog system organizes the inventory records related to artifacts. In 1977, electronic databases were first used by Corinth Excavations, but the card catalog still is kept up to date. Corinth Card: Coin 1959 1757: AR Hemidrachma, 400 B.C. - 315 B.C.